beIN SPORTS is a relatively new entrant to the world of broadcast television but is already starting to carve out space for itself. It’s a subsidiary of beIN Entertainment Group – which is owned and financed by Qatar-based media juggernaut Al Jazeera – thereby giving it the clout to compete with other heavyweights such as Star Sports and ESPN. ExpressVPN Our top choice for beIN SPORTS. Blazingly fast server network operating in over 90 countries. Secure and private apps that can unblock most popular streaming sites. Includes 30-day money back guarantee. NordVPN Budget service that doesn’t cut corners in terms of privacy or security. Fast enough for good streaming quality. CyberGhost Low-cost provider that has easy to use apps that are great for first-timers. We were impressed by servers speeds during our testing. IPVanish Good streaming speeds and apps that are remote control friendly and easy to use. VyprVPN Solid privacy and security that can unblock most streaming sites but on the pricier end of the scale. The streaming upstart is now present across the world – including the Middle East & North Africa, the US, Canada, Spain, France, Thailand, Australia, and other parts of Asia. There are dozens of HD channels live streaming everything from the Premier League, Bundesliga, La Liga, and the Champions League. Other sports are available too – rugby, cricket, tennis, F1, and golf. Online-only streaming packages start at US$25/month and it’s also possible to log in if you subscribe to a compatible cable TV service. Click here for a full list of partner cable networks sorted by your location. But the service will only work within your home country – even if you subscribe to one of beIN SPORTS’ streaming packages or get access via your cable network. For example, a Canadian resident that’s signed up will require a Canadian IP address to log in and watch beIN SPORTS online. In this guide, we’ll take you through a step-by-step process of how to access beIN SPORTS from anywhere in the world via a VPN. The easiest way to overcome this problem is by using a Virtual Private Network (VPN). A VPN is an excellent piece of software that’s designed to encrypt all the internet traffic to and from your device, and tunnel it via a server outside your current location. You are thus assigned an IP address associated with the country that the VPN server is located in. Using a VPN guarantees anonymity and privacy whilst also unlocking a bunch of geo-restricted content such as Netflix, BBC iPlayer, Hulu, and beIN SPORTS. ExpressVPN is known for its impeccable standards, commitment to privacy and security, and blazing fast speeds. It boasts an impressive 145 server locations spread across 94 countries, so finding an adequate connection shouldn’t be a problem. All servers use the OpenVPN protocol, 256-bit AES encryption, 4,096-bit RSA keys with perfect forward secrecy, and SHA512 authentication. It’s able to unlock a bunch of geo-restricted content including Netflix, Hulu, BBC IPlayer, HBO, SkyGo, Foxtel, and more. If you subscribe for ExpressVPN, you’ll notice that DNS servers are included and DNS leak protection is built-in. There’s also an internet kill switch which will temporarily halt all traffic if the connection drops unexpectedly. It has apps for both Android and iOS as well as desktop support for Windows, Mac OS, and Linux (command-line). The service is registered in the British Virgin Islands which means it doesn’t need to automatically comply with any requests for user data by government authorities in the West. Furthermore, it has a stated policy of retaining no traffic logs except for some metadata about the date (not time) when connected to the service, choice of location, and total bandwidth used. best VPN for beIN SPORTS:ExpressVPN is our #1 Choice. Optimized for high-speed connections. Excels at unblocking beIN SPORTS and most popular streaming services. Hard to beat on privacy and security. There is a 30-day no-quibbles money-back guarantee so you can try it risk-free. NordVPN steps it up a notch when it comes to server options – offering 982 servers spread across 58 countries. The default protocol is OpenVPN over UDP, but OpenVPN over TCP is also available in the app. Users have the option of choosing a server by country or type – the service offers servers optimized for anti-DDoS, video streaming, double VPN, Tor over VPN, and dedicated IP. DNS leak protection and an internet kill switch are included. NordVPN also follows a strict no-logs policy which means it’s impossible to track any sort of user behavior. There are apps for both Android and iOS as well as desktop support for Windows and Mac OS. Users have the option of paying via Bitcoin and the company itself is registered in Panama – hence not subject to any mandatory data retention laws. GREAT VALUE:NordVPN is a solid all-rounder. Works well with beIN SPORTS. Solid security and privacy performer. Strong security features and accommodates up to 6 devices. Includes a 30-day money back guarantee. CyberGhost is a no-frills provider that’s light on your pocket without compromising on the essential features of a VPN. Our review of the service indicated that it can handle video streaming without any lag or downtime – that’s great if you want to stream beIN SPORTS. The company has an internal policy of not storing any user data so you can rest assured that your privacy is covered. There’s a total of 1,111 servers spread across 43 countries – plenty of options to gain a fast, stable connection. Encryption standards are robust. CyberGhost Pro uses 56-bit AES encryption on the OpenVPN protocol by default along with 2,048-bit RSA keys and MD5 HMAC authentication. There’s an internet kill switch included with all paid packages. EASY TO USE:CyberGhost is great beginners' choice. A budget choice. Good on privacy. Streams beIN SPORTS reliably. Hit and miss connections with some other popular streaming services. 45-day money back guarantee. IPVanish is a premium VPN provider because it physically operates and manages its own servers as opposed to other services that also rent. There are a staggering 750 servers spread across over 60 countries which rank favorably when subjected to speed and latency tests. DNS leak protection and an internet kill switch is built-in with Bitcoin an accepted form of payment. The company keeps zero records of VPN use other than when an account is registered for the first time. Servers use the 256-bit encryption on the OpenVPN protocol by default, SHA512 authentication, and a DHE-RSA 2,048 key exchange with perfect forward secrecy. IPVanish offers apps for both Android and iOS with desktop support for Windows and Mac OS also included. VyprVPN is another example of a tier-1 VPN service given its decision to invest in its own servers rather than renting. And it does a pretty good job at that, too, with over 700 servers in 70 odd countries. VyprVPN is particularly robust when it comes to dodging sophisticated blocking tech such as China’s Great Firewall. It uses 256-bit AES encryption as standard as well as DNS servers and DNS leak protection built-in. There’s also an internet kill switch which will freeze traffic if the connection drops unexpectedly. Read our full review of VyprVPN here. It’s possible to find a free VPN option online – even a rudimentary search on Google, Duck Duck Go, or Reddit will do the job – but it’s best to avoid such traps. Building and maintaining a quality VPN isn’t something that can be done overnight or for free – such services are in the business of making money as well. They might appear to be free to use but they’ll monetize by intrusively tracking your browsing history, selling that data to third-party advertisers, as well as bombarding you with all sorts of pesky ads. Some services, such as Hola VPN which once boasted over 50 million users, have used their scale to attack other sites and turn users into nodes for diverting internet traffic from other sources. And forget about choosing from hundreds of servers optimized for speed and stability – such options have restricted choices and your connection is bound to drop from time to time. The possibility of contracting a malware infection is also very high. It’s possible to stream beIN SPORTS on your Android or iOS smartphone using the companion app. In this case, it’s as simple as connecting to a server in a supported country using your VPN provider app. You might want to restart your phone first so that the process is seamless, and be sure to disable your GPS so your true location isn’t disclosed. The official beIN SPORTS Connect app is also compatible with Roku, Apple TV, Playstation, and Chromecast. These platforms don’t support VPN apps by default, but it’s still possible to connect by leveraging the VPN on a physical or virtual router. The latter is possible because most PCs that connect to wifi are also capable of broadcasting wifi signals for other devices. Check out our tutorials on how to set up a VPN with a virtual wifi router for both Windows and MacOS devices. What’s next for beIN SPORTS? beIN SPORTS has acquired exclusive broadcasting rights for global sporting events such as the Olympics in the Middle East and North Africa, as well as the EPL, Champions League, Europa League, International Tennis Federation, and several others. It’s also expanding rapidly in Southeast Asia – there’s agreements in place to broadcast its channels on cable TV networks in Hong Kong, Indonesia, Macau, the Philippines, Brunei, Cambodia, Laos, Thailand, Singapore, Malaysia, China, Myanmar, and Vietnam. Not all these locations support online streaming so it’s best to check before signing up for a package. How do I access beIN SPORTS? 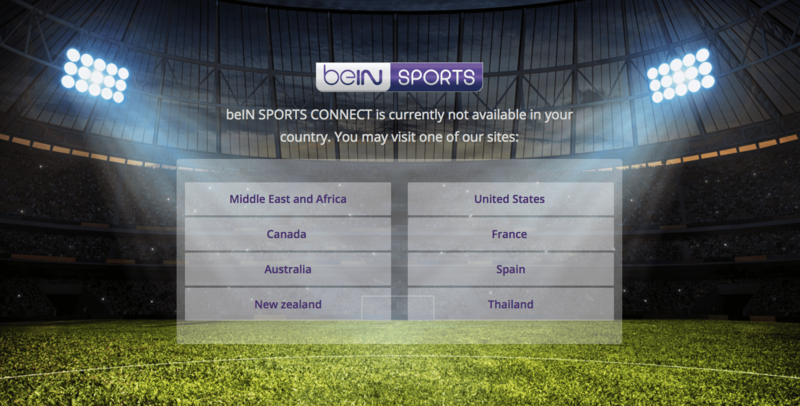 Any user can log on to the official beIN SPORTS website without the express need of a VPN – but this portal is a mere shadow of the entire experience. It offers breaking news, analysis, and short video snippets but the livestreaming option is available only for those who pay or sign up via a partner cable TV provider.